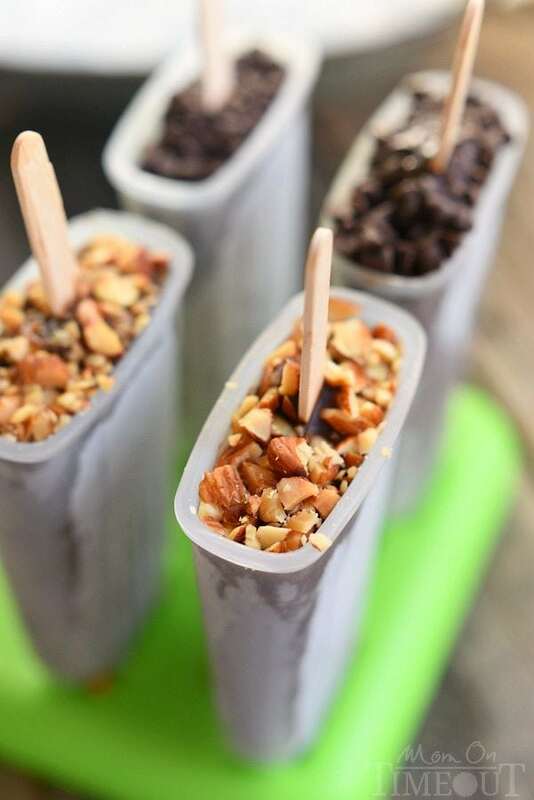 You are going to fall in love with these easy and delicious Mocha Almond Fudge Pudding Pops! 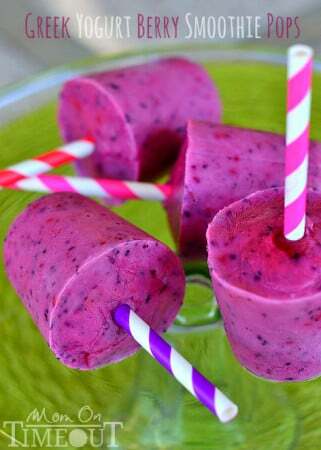 Just perfect for hot summer days! Dude! It has been H-O-T hot these past few weeks. Blazing hot. And naturally, on days when we have a swim meet, the sun likes to turn it up a notch to really make us suffer. Good news? This past weekend marked the end of the swim season for us. Hallelujah! I actually really enjoy swim season but I have to admit I’m pretty to excited to reclaim my evenings and Saturdays every week – what in the world will I do with all that time?? 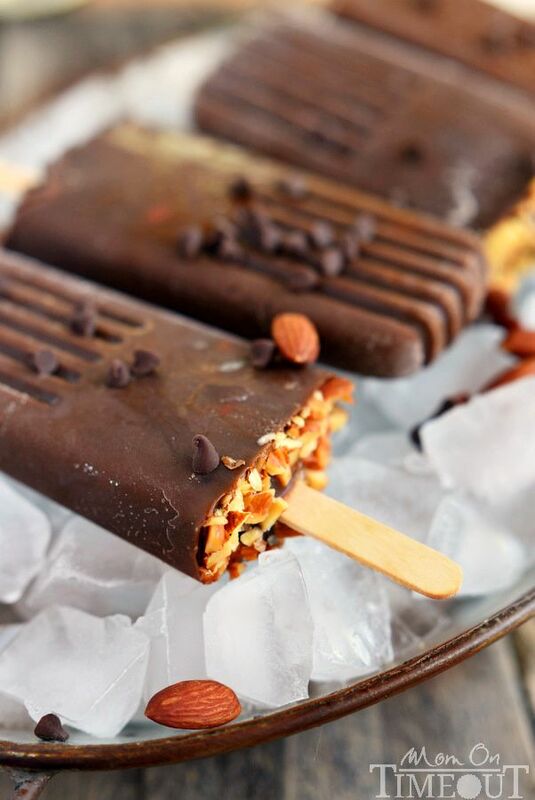 We are always looking for delicious ways to cool down during the hot summer days…enter today’s recipe: Mocha Almond Fudge Pops. I kinda sorta made these for me. Like, only for me. Mama needs her treats too! I think we all know by now that I like mocha EVERYTHING and Mocha Almond Fudge just happens to be one of my favorite ice cream flavors. Shocker, I know. I slipped up and let the boys see me making the pops. I kindly told them that they were for me and that I’d make them something else later. Well, later never happened and they jumped right in when I was taking pics. Once they tasted these pops, they were HISTORY. Like, demolished, devoured, GONE. 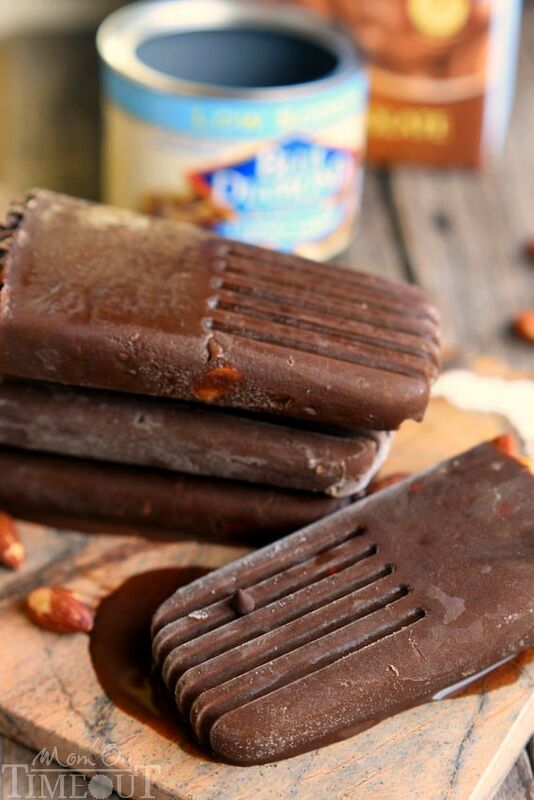 So these fudge pops are a breeze to make – like, it just doesn’t get much easier. I used Almond Breeze Chocolate Almondmilk and a few teaspoons of espresso powder to get that awesome mocha flavor. Whisked in a packet of chocolate pudding mix and you’re more than halfway there. 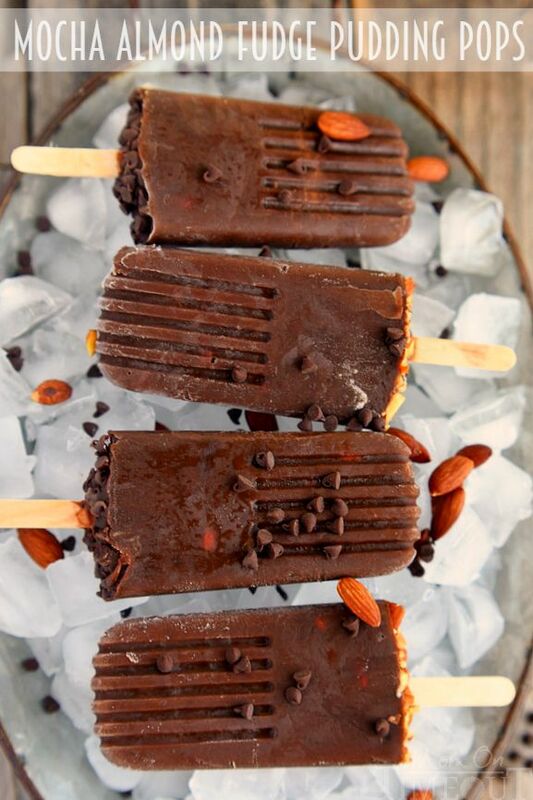 A handful of chopped almonds and mini chocolate chips and tada – Mocha Almond Fudge Pudding Pops! You’re going to want a nice ice pop mold – any will do and I used a funnel to make things cleaner and easier. Seriously, these pudding pops are ridiculously good and are the BEST way to cool off on a hot summer day – promise! Pour the chocolate almondmilk into a microwave safe container and heat on high for 2 minutes. Whisk in the espresso powder until dissolved. Place the mocha mixture in the fridge until chilled. Add the pudding mix to the mocha mixture and whisk for two minutes. Stir in the mini chocolate chips and chopped almonds. Fill your ice pop mold leaving a little room at the top. Place the mold in the freezer for 30 minutes to let the pops partially set up. 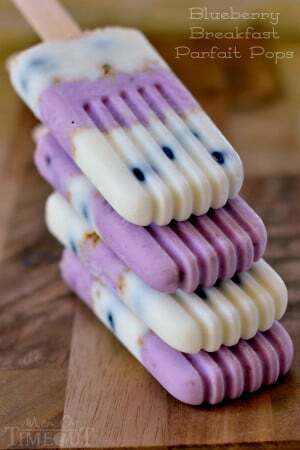 Insert the popsicle sticks and add finely chopped almonds or mini chocolate chips to the base if desired. Freeze for at least four more hours. To remove the pops, run under warm water for just a few seconds until the pops loosen up enough to easily pull out. More treats perfect for summer! This “Easy as Breeze” post is sponsored by Almond Breeze Almondmilk. 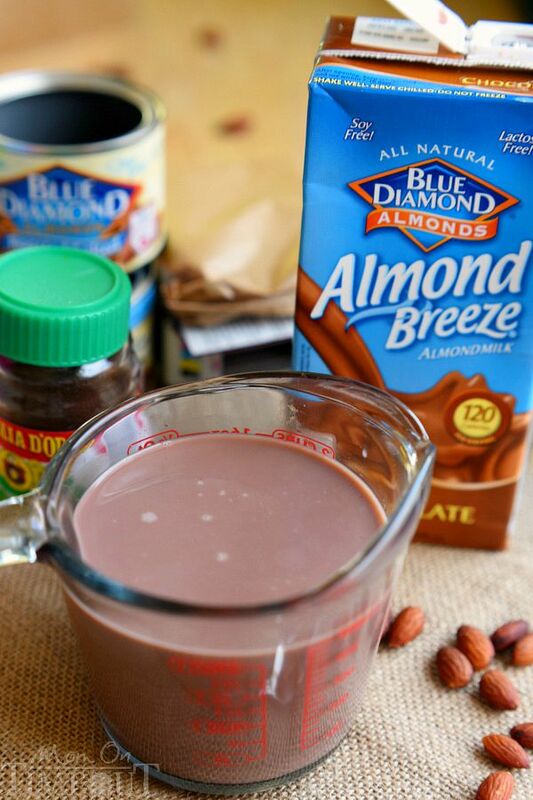 For more “Easy As Breeze” recipes made with five ingredients or less, visit Almond Breeze on Facebook, Twitter, Instagram, and Pinterest. All opinions are, as always, 100% my own. Thank you for supporting the brands I love and that make Mom On Timeout possible! 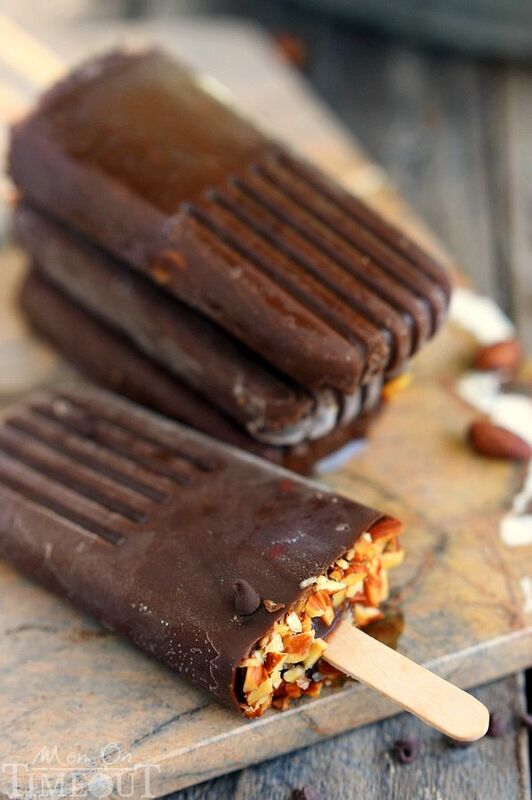 I love the mocha flavors in these pops, and all the almond goodness in these sounds delicious! 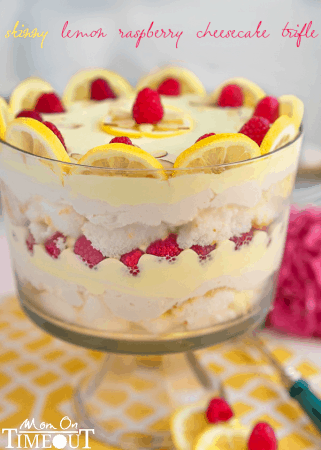 This is the perfect summer treat! Oh my goodness! This is chocolate frozen heaven! Oh heck, I hide popsicles from my kids all the time! I figure if I spent all that time making them, I deserve to have some all to myself! 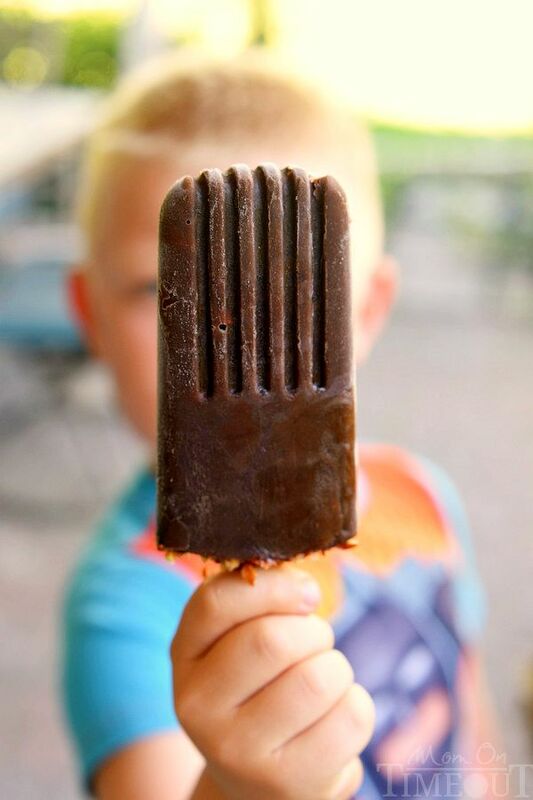 I’d probably make three batches of these fudge pops, share one and hide two! See, that’s what I was thinking too Tanya. I did do ALL the work 🙂 Thanks for stopping by! I love that you used pudding mix!! Fantastic. Wow! With our weather today, I would love a few of these. They look amazing! It has been SO hot in Sacramento Kristi – we need a break! You are so sweet Carrie – thank you! !